The Tale of Cuckoo Brow Wood by Susan Wittig Albert, a Mysterious Review. 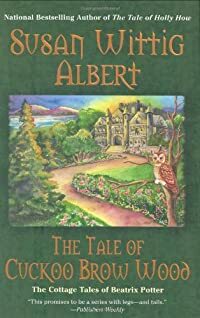 Review: "The tale I am about to tell you begins on a bright, clear, April-sweet morning in the Lake District of Sawrey." So begins Susan Wittig Albert's utterly charming and beautifully written Beatrix Potter narrative mystery, The Tale of Cuckoo Brow Wood. This book is the third entry in the author's series, The Cottage Tales of Beatrix Potter. Albert displays a wide range of writing talents in The Tale of Cuckoo Brow Wood. She portrays Beatrix's land between the lakes with amazing clarity using expressive descriptions and imaginative details. The story is an extension of the landscape and is an affable mystery with Beatrix Potter as the gentle sleuth. And there are elements of comedy as well: the scene in Dimity Woodcock's kitchen as she is serving "her" sticky buns is quite humorous. There are several thoughtful additions to the book that make it even more enjoyable. A map and cast of characters act as an introduction to the tale. Historical notes and additional resources on Beatrix Potter serve as postscripts. Finally, a glossary of terms is both helpful and informative. The joy that Albert surely expresses in writing this series is abundantly evident in The Tale of Cuckoo Brow Wood. It is highly recommended. Acknowledgment: Penguin Group provided a copy of The Tale of Cuckoo Brow Wood for this review.